Just because I have trouble understanding it does not mean I can’t make fun of it. The sad thing about this was that the first one I did had a major typo in it. It is unclear where the original image came from (Richard Stallman). 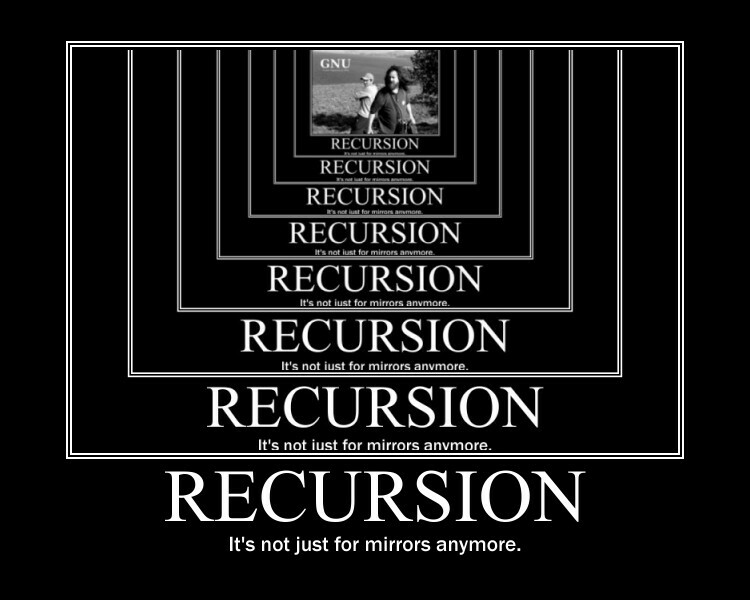 A recursive process is one in which objects are defined in terms of other objects of the same type. Using some sort of recurrence relation, the entire class of objects can then be built up from a few initial values and a small number of rules. The Fibonacci numbers are most commonly defined recursively. Care, however, must be taken to avoid self-recursion, in which an object is defined in terms of itself, leading to an infinite nesting.